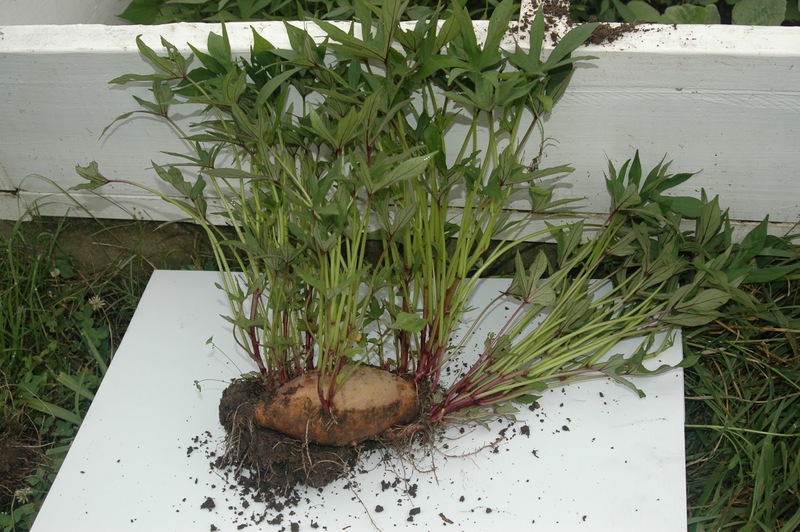 Producing slips from sweet potato tubers is relatively easy, but to make the most of your growing season you will need to start propagation 3-4 weeks before your last frosts which in the United Kingdom can mean starting any time from the end of February. To begin with you will need a good free draining compost, and this can be made by taking standard seed compost and adding to it an equal part of horticultural grit to give you a 1:1 grit/compost mix. The next thing to do is to take this new mix and add it to a deep and reasonably wide pot or seed tray. 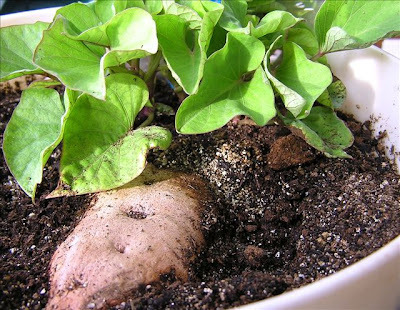 Take your fresh, disease-free sweet potato tuber and plant it on its side in its container before giving it a good water. Keep the planted container in a warm location - such as a windowsill above a radiator - preferably at a temperature of between 20- 25 degrees Celsius. Keep the compost watered during this growing period but take care to make sure that it does not become waterlogged. 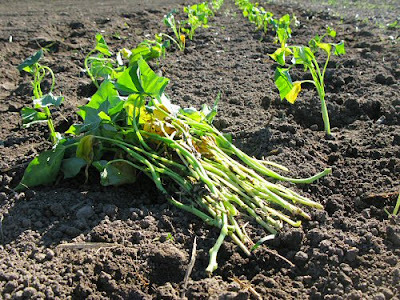 New shoots, known as slips, should appear in two to three weeks, and as soon as they are showing three to four healthy-looking leaves they will be ready to be separated from the parent for use as propagation material. Using a sharp and sterile knife, carefully remove the slips from the main tuber. Each slip will have its own set of roots attached and these will need to be kept as intact as possible. If there is no longer a threat of frost then you can plant these rooted slips outside once soil temperatures reach over 20 Degrees Celsius, ideally, plant under a cloche or fleece tent for that little extra protection – but this can be removed after a few weeks. They will require a very fertile but light, and preferably sandy soil. If your soil is not naturally free-draining, then it is worth planting your slips into ridges 6-12in high, with 2-3ft between each row. Each plant should be spaced 12-18in apart on each ridge. Alternatively you can try using longer 12 inch slips, removing all but the tiny leaves at the very tip. Plant the cutting by covering the whole length with soil, only the leaves of the tip should stick out of the ground. The cuttings will root at every leaf node. Not just the leave nodes under the ground will root. A sweet potato also grows roots from every leaf node that develops as your cutting grows. This time leave 2-3 ft gap between slips. Once the newly planted slips begin to take off keep them well watered and feed weekly with a high potash fertiliser.